Often times when switching hosting companies we would like to see what your domain name looks like before finalizing DNS changes by changing nameservers. 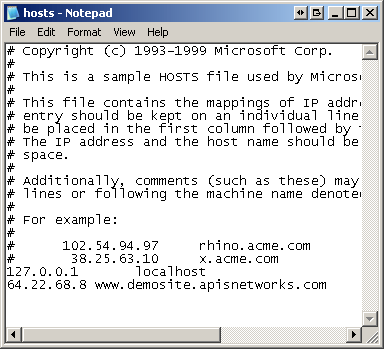 Overriding DNS is done through a HOSTS file. 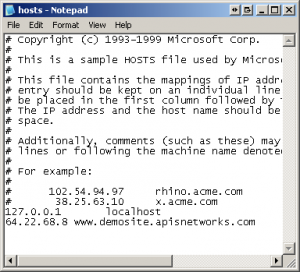 Any entry in a HOSTS file overrides any other DNS setting that is resolved by a nameserver. Visit http://apnscp.com to access apnscp.com on the server with an IP address 64.22.68.1. Your server IP address can be found within the control panel under Account > Summary > General Information > IP Address. Click on Start menu. Browse to All Programs > Accessories. Right-click on Notepad and select Run As Administrator. If a UAC prompt appears, allow the application to be run as administrator. Go to File > Open. Enter %SystemRoot%\system32\drivers\etc\hosts. DNS will be updated once the file has been saved and Notepad closed. Open up a terminal session, then enter sudo nano /private/etc/hosts. Once changes are done, CTRL + O to save, then CTRL + X to exit. To flush DNS cache, once exited from the text editor, issue sudo dscacheutil -flushcache in the terminal. Similarly to Mac OS X, open up a terminal session, and enter sudo nano /etc/hosts. Make changes to the host file, then CTRL + O to save, then CTRL + X to exit. DNS will update automatically. This entry was posted in DNS.